Experimenting with underwater photography can be an exciting prospect, but one can often feel overwhelmed by the amount of necessary knowledge. This article intends to help you choose the best kind of camera and equipment required for capturing the most vivid images beneath the waves. 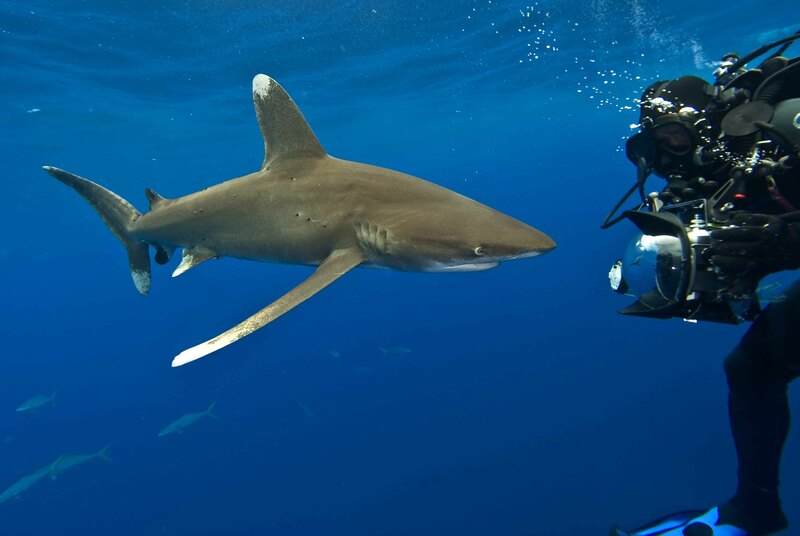 Read on to find some useful underwater photography tips on how to get started. If you want to learn the basics of underwater photography, our guide is the perfect place for you. This introductory section will help you find your way around the breathtaking hobby of taking underwater images. Below you will find the most important theoretical things you need to know. Underwater photography deals with taking photographs while submerged in a lake, the sea or the ocean . It usually occurs during scuba diving trips, but the photographer can also capture the underwater landscape by simply swimming or snorkeling. Underwater images can also be taken in pools or water-tanks. Firstly, you must be aware that underwater photography comes with its own rules – some of which don’t apply when shooting subjects on the ground. Light, for instance, travels differently through water, which means that you will need external artificial lighting to get vivid, colorful photos. Without a strobe or a light, your pictures will be predominantly blue and kind of murky. Secondly, also keep in mind that water gets in the way of sharp, fully-contrasted images. Therefore, underwater photos require the photographer to get really close to the subject – sometimes even within 1 meter – to capture satisfying raw images. Backscatter is what happens when you try to shoot an underwater subject in the distance without the appropriate external lighting. The term describes the little particles that will sometimes appear in your photographs; an inexperienced photographer might often mistake them for a dirty or dusty lens. Thirdly, you might want to get your diving skills under control before you take your camera underwater. Using the equipment can be rather distracting, which can lead to random resurfacing or even clashing with the corals. Now that we have reviewed the most basic facts about underwater photography, let’s move on to the required gear. Even though we’re only going to scratch the surface of the subject at the moment, you can always check out this article about the best underwater cameras for a more extensive talk about what you will need. If you’re looking for something not too expensive, the Canon Powershot D30 should catch your interest. Waterproof up to 82 feet in depth, this model is one of the best for amateurs and professionals alike. At the same time, the GoPro Hero Session could be a great option for beginners. It takes amazing underwater videos and it makes it easier for first-timers to get the hang of UW photography. But equally important when it comes to underwater sessions is the protective equipment you buy for your camera. As soon as you buy your camera and lens, you need to start looking for an underwater housing. Since saltwater is the most abusive to sensitive photography gear, it is vital that you buy the appropriate housing for your camera. Housing is a term that refers to the camera protection – usually made of polycarbonate or aluminum – that keeps the water away while also giving you access to the camera’s settings. Most of the housing manufacturers on the market are good enough, even if you don’t buy the priciest there is. However, some of the best that you might be interested in are Ikelite, Patima, and Sea & Sea. With prices ranging from expensive to affordable, these three companies are often mentioned and used by professional diving photographers. Keep in mind that the best housings are the ones made for specific camera models. Also important is the fact that you should know that the accessories required for underwater photography can get pretty expensive – almost as expensive as the camera itself. After you have bought a camera and a housing, it’s time to do some research on external lighting. As we said before, the internal flash of the camera is rarely enough for clear, crisp underwater pictures, so you need the help of a strobe (or two) to get the job done. For more information on strobes and other types of lighting that you might need, you can check the Ikelite website (they also present user reviews of the equipment). Now that we have the basics under our belt, it’s time to see what kind of underwater photography captures your interest. Believe it or not, underwater wildlife photography is by far the only one when it comes to capturing subaquatic shots. Keep in mind that we’re barely dipping our toes into the many possibilities of underwater photography and that nothing can stop you from trying something new and never-done-before. Capturing the ocean’s wildlife is possibly the kind of UW photography that first comes to mind – perhaps because it makes the most sense to photograph something that’s already in the ocean. Touzon also recommends scuba diving over snorkeling because it gives you more time to get closer to your wildlife subjects. However, taking photos near the surface can also be very rewarding, because whales and sharks are more easily found there. Having said that, it’s time to move to more unusual types of UW photography. 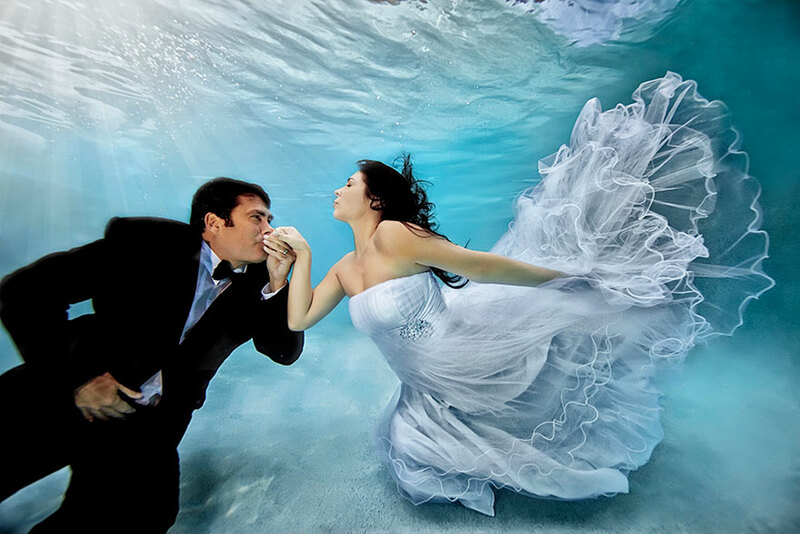 Wedding underwater photoshoots are not so uncommon, and the photographer can have as much fun as the bride and groom. Luckily, you don’t need to be close to the ocean – a shallow pool will do. It’s fun to recreate typical wedding shots underwater; just ask the bride and groom to show some love. Also, make sure you take the pictures during the day and against the natural daylight entering the pool. This type of UW photography allows the photographer to experiment with the ways fabric sways in this environment. It’s not complicated to match fashion with UW photography; you just need to find the right approach. Soft fabrics and uncomplicated outfits are some of the things you should look into for the first shots. When it comes the model, beauty, and good looks are not enough. Needless to say, your subject needs to feel comfortable posing underwater, so keep that factor in mind. However, the key point of a successful underwater shoot is dealing with communication – or rather, the lack of it. Talking with your model is evidently impossible, and hand signals won’t do much good either. A proper planning session with your team is preferred rather than just diving in and winging it. Obviously, there are more types of UW photography, focusing on animals, surf, maternity shots, and even baby photo sessions. Underwater dog photography, for example, is pretty popular. The ocean – and your imagination – is the limit. As I said before, this article does not claim to be extensive in any respects. Plenty of tutorials and online courses can help you become familiar with the subject of underwater photography. For those who are more apt for visual learning, check the YouTube tutorial embed below to help you get going. However, one of the most extensive resources online on the matter of UW photography is www.uwphotographyguide.com. This website can guide you through what could be a very technical and unapproachable subject. Another useful provider is Dive Photo Guide. The info they provide is not only for beginners, so check their website even if you’re just looking to fine tune your underwater photography skills. To sum up, we hope these tips on getting started with underwater photography are helpful to you. The resources featured in the piece can help you do more than scratch the surface, so have a look. Have you tried underwater photography? What are your experiences with this fascinating photography technique?